I hope everyone had a Happy Valentine's Day! I definitely did. Hubby thought it would be funny to "surprise" me with nothing on Valentine's Day. He thinks he is pretty darn funny. He comes home from work while I am slaving away (OK- not really working that hard, but still...) in the kitchen making a fancy dinner and dessert for us to share. My gift to him was the special dinner menu and a lovely heartfelt Valentine's Day card. So he walks in the front door with nothing in his hands but his dirty lunch containers. Now, this is our first Valentine's Day as a married couple, so I really wanted to make it special and set a good precedent. We haven't always made a big deal about this holiday in the past though, so I didn't know what to expect. We had already discussed going to a fancy restaurant over the weekend to celebrate, to try and avoid the crowds at the restaurants on the actual holiday. So I told myself not to be upset that he didn't get me anything, because going out to dinner would be my gift. So then I hand him his card, and he looks surprised... then he says he needs to run out to his car. What!!! Come on now... don't play with a woman's emotions like that! So he comes back in from the car with my favorite flowers (lillies) AND amazing chocolates and an awesome pair of running pants. Turns out he left work earlier than he let on, went and did a little shopping, and "surprised me" by pretending he got me nothing. What a jerk! Just kidding. I love my little jerk. More than anything. Anyway, dinner was awesome. 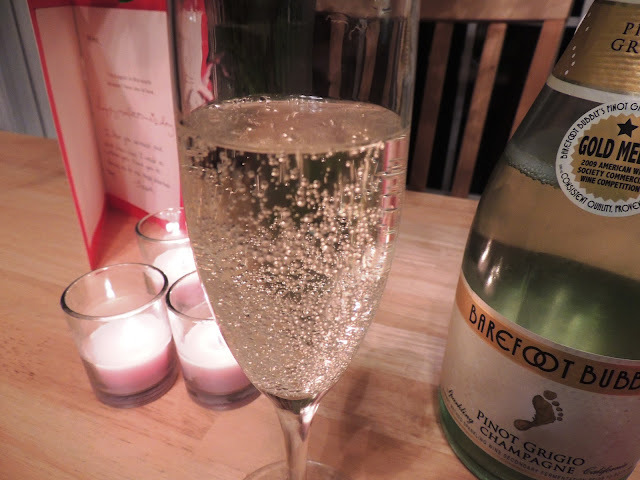 We opened a bottle of champagne that was given to us for our wedding. 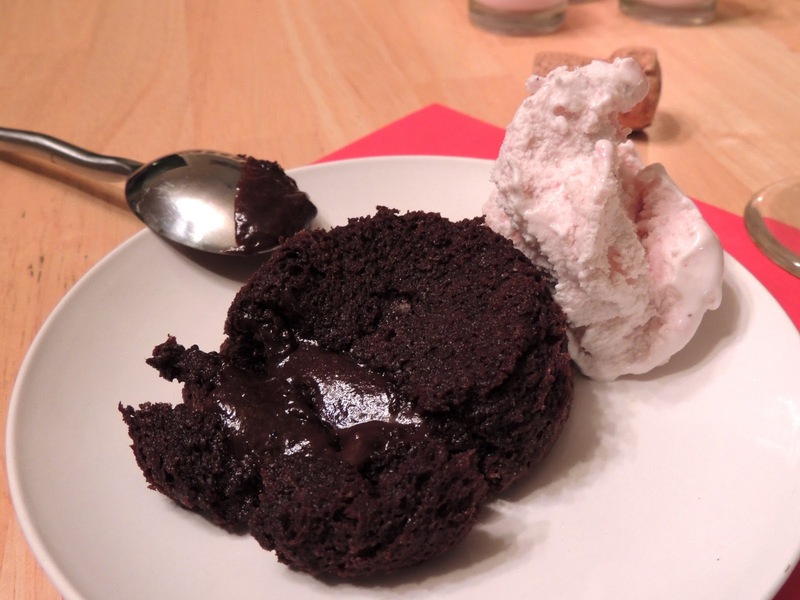 I made Chocolate Molten Lava Cakes topped with his favorite, strawberry ice cream. 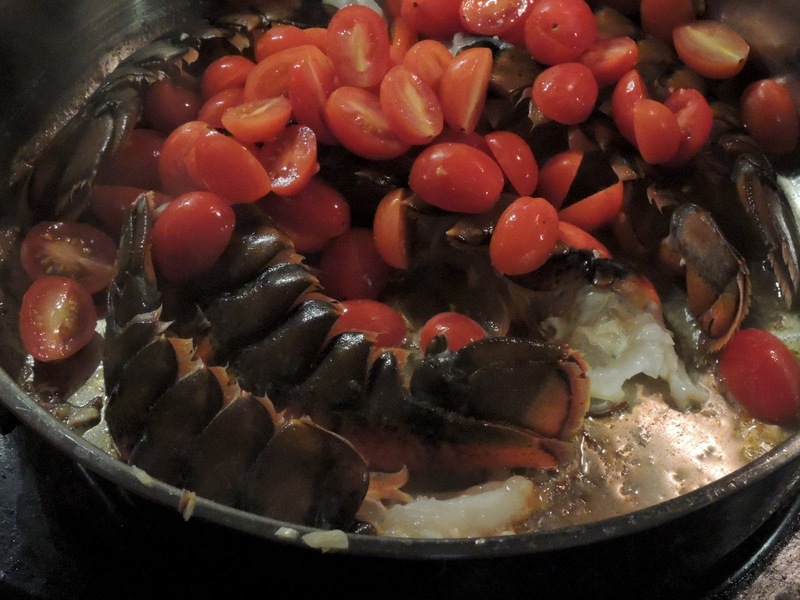 And for dinner, we made Seared Lobster Tails with Saffron Fettuccine Alfredo. Apparently some people say Chocolate Lava Cakes are a thing of the past... I say, those people are dumb. I don't think there could really be anything better. Ooozing chocolate?! Umm, yes please! Next, I'm going to play with the flavors and add some peanut butter, or caramel to the oozy goodness, or maybe some Kahlua. Ohhh yeah, I'm going there. Get excited. Sorry, I'll stop drooling. Here are the recipes. Side note: I made the cakes well before dinner, but didn't cook them until when we were ready for dessert. 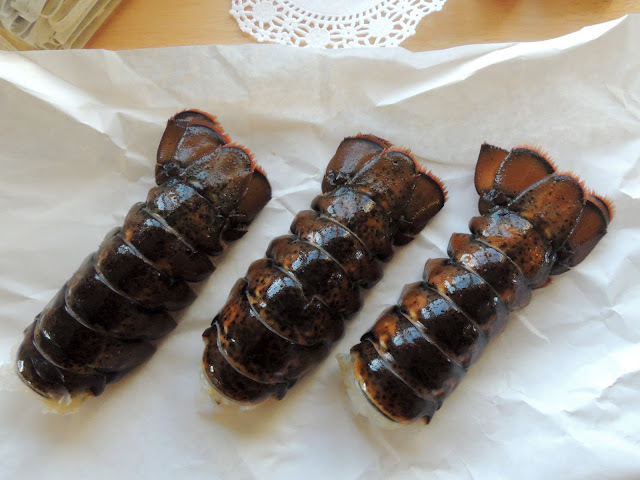 I only cooked 2, and kept the other 3 in the fridge and made them the next night! In a large bowl set over a saucepan of simmering water, melt the stick of butter and semisweet chocolate until smooth, stirring a few times. Set the melted chocolate aside and keep warm; keep the saucepan of water simmering. In another large bowl (I used the same one as you can tell, hate dishes! ), whisk the eggs with the sugar and Truvia. Set the bowl over the simmering water and stir the eggs until warm. Remove the bowl from the heat. 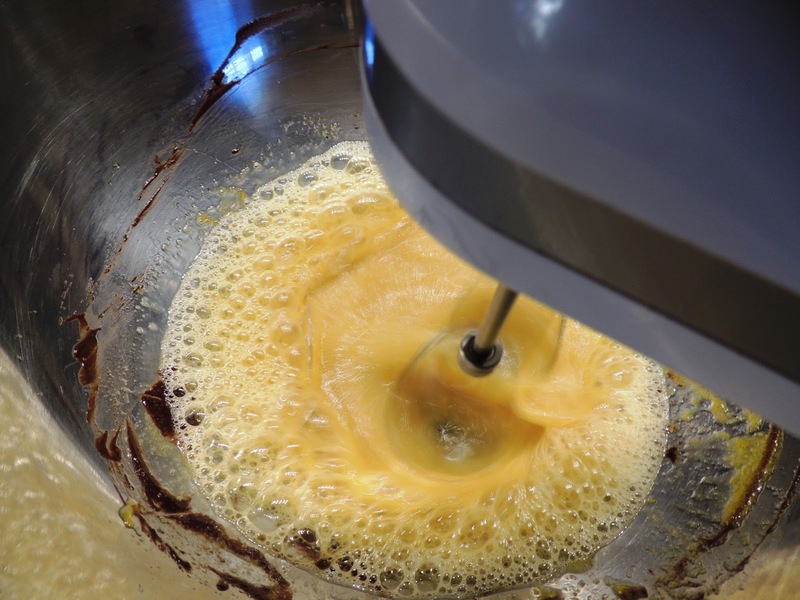 Using an electric mixer, beat the eggs at high speed until doubled in volume, about 5 minutes. Sift the flour over the chocolate mixture and gently fold in with a rubber spatula. Working in 2 batches, fold in the warm egg mixture. Carefully invert the ramekins onto plates to un-mold the chocolate cakes. Top each cake with a scoop of strawberry ice cream, and serve right away. Cook the pasta according to the directions on the package. Drain. 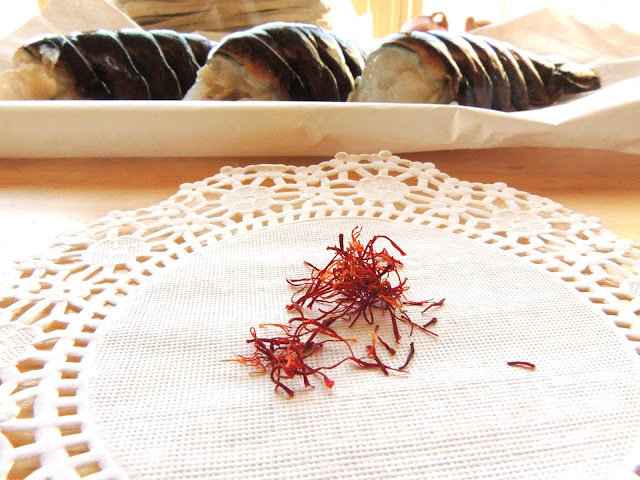 Drizzle with some olive oil to prevent sticking together. Set aside. In a large saute pan over medium high heat, add the olive oil. When shimmering, add the shallot and garlic. Saute about 2 minutes, then transfer to a small bowl and set aside. 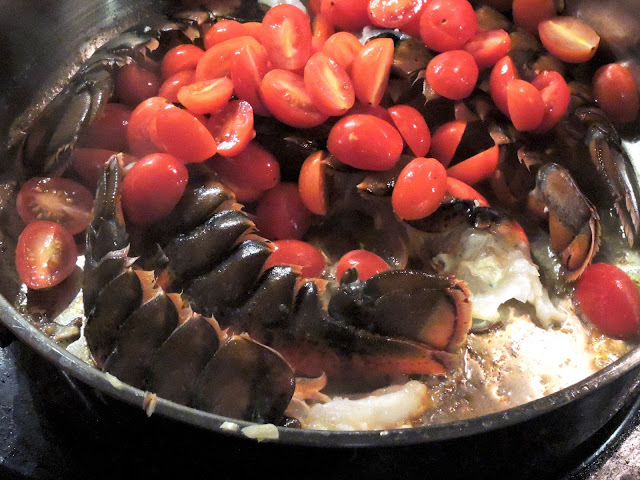 Place the lobster tail halves flesh-side down in the pan, and cook for about 5 minutes, until the shells have turned a bright red. Just be careful not to OVER cook. 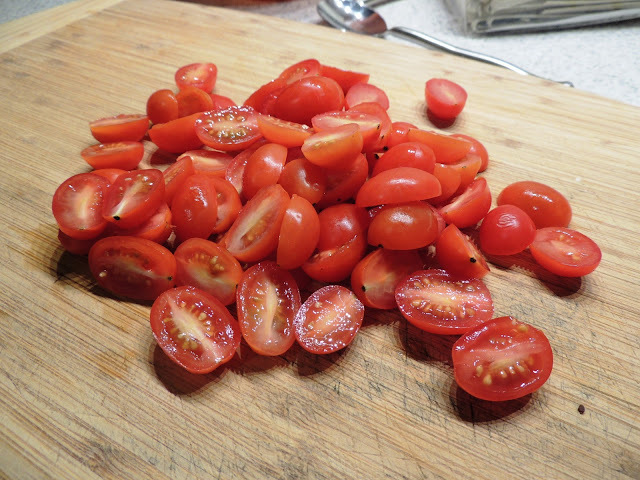 Add the tomatoes to the pan. Remove the lobster from the pan and let cool. Meanwhile, in a small saucepan, heat the half and half over low heat. (This way it won't curdle when you add it to the saute pan). Add the saffron threads to the 1/4 cup hot water, and let steep for about 5 minutes, then add this to the cream. Add the flour to the saute pan and stir, cooking about 1 minute. Add the white wine to deglaze the pan and let cook down for about 1 minute. Add the cream and saffron mixture to the saute pan, as well as the 1/8 cup cheese. Carefully remove the lobster meat from the shells. Add the sauteed vegetables and pasta to the saute pan and toss to combine with the sauce. 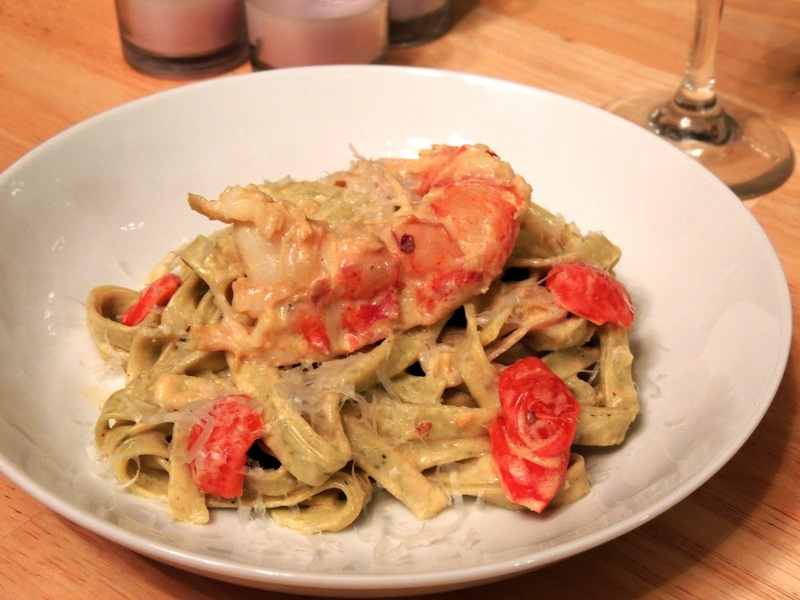 Serve the lobster atop a serving of the pasta. Top with more Parmesan cheese if desired, and some chopped chives.